The Scarecrows is creepy, but behind it all there's a moral about anger, frustration and how you should face it rather than run away from it. The main character's eerie adventure as he holes up in an abandoned mill is easy for readers to relate to. Everyone has something that they want to run away from, whether it's in-laws, the loss of a loved one, being fired from a job - in the main character's case, it's his mother's remarriage to a man he hardly knows. But running away from his troubles only makes things worse when something sinister happens. Robert Westall is a genius. SCARECROWS is a chilling book, brilliantly written. Simon is struggling to come to terms with himself and the changes in his family. When he goes to stay with his mother and her new boyfriend, he discovers a creaking old mill with a dark past.This is a terrifying book without any gore or cheap scare tactics. The building of the tension is deliciously unbearable and the ending will keep bouncing around in your head long after you finish reading it. Whenever I had to stop reading I was desperate to get back to find out what would happen next.I would recommend this book to anyone, but especially boys from 10 - 14 -- even boys of that age who don't really like to read. I loved this as a child, and loved it today. On the surface, this is still the cracking ghost story I remember and it is still just as chilling. At eleven I remember being too scared to turn off the light and the same bloody thing happened last night over twenty years later! There is quite a lot going on in this short children's novel and some of the more adult themes (and there are a fair few) probably went over my head when I first read it . The characters are quite complex and the hero of the piece is a lot more dark and twisted than I remember. Dare I say it, they don't make 'em like this anymore. Or maybe they do and I just don't know about them. 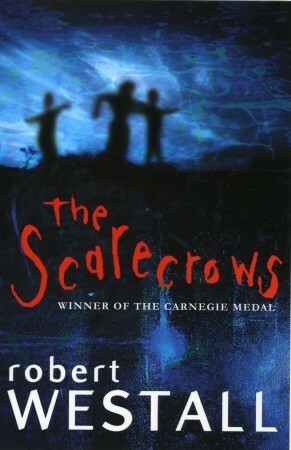 I don't think I have a favourite book of all time, but if I did then I'd have to say The Scarecrows. I first read it when I was thirteen - the same age as the central character Simon Wood - and it had a lasting effect on me. I recently re-read it and found it just as compelling as an adult. Robert Westall (and this book in particular) is in fact the main reason why my own first two books are in this same genre, i.e. young adult ghost stories, and with some similar themes. He has been a major inspiration for me, more than any other single writer.Why is The Scarecrows so good? Well for one thing I've always liked ghost stories, but this is so much more than that. It's also a psychological thriller and a powerful emotional drama. Simon is utterly believable as the lonely, angry and confused boy who idolises his late father and sees his relationship with his mother begin to disintegrate after her remarriage to a man he hates. What makes this seem so gut-wrenchingly real is that it's mainly Simon's own inner demons that are tearing his family apart - and as his misery and isolation grows, so the unquiet ghosts in the ruined water-mill across the fields begin to stir, grown in power and move closer and closer ... but what will happen when they finally arrive? The fact that we're never told only adds to the chilling power and tension of the climax.Simon is the best thing in the book. Westall did brilliantly to paint such a dark, complex and yet sympathetic character. But all the other characters convince too, and in general the quality of Westall's writing is superb throughout, clearly superior to most other writers (childrens' and adults') that I've seen since. It hooks you from the startling first sentence to the rather abrupt, slightly ambiguous ending. And there's the odd flash of humour too, despite the dark themes.If you have any interest at all in ghost stories, this is a must-read - but even if you don't, still give it a go. It's so much more than a bog standard paranormal yarn. It's best suited to teenage readers - probably not younger - and adults. The story is a third-person narrative, but the point of view is entirely that of Simon Wood - his thoughts, feelings and memories, the things he sees and experiences, conversations he has, conversations he overhears. The novel opens at Simon's boarding school, where the poisonous atmosphere of bullying and denigration has nurtured Simon's "devils", as he describes his blind rages. It is there that he first sees Joe Moreton, who has given Simon's widowed mother a lift to an event at the school; Simon loathes him at first sight, regarding him as a "yob", unimpressed by his fame as an artist.He is enraged when he overhears a conversation at an art gallery which makes it clear that Joe and his mother are dating, and when his mother tells him she intends to marry Joe he vainly begs her not to, and refuses to attend the wedding. Eventually he has to join his mother, his sister and Joe at their new home in Cheshire. Both his mother's happiness and his sister's adoration of Joe incense him, as he regards them as betraying his father's memory. The nearby unused water mill, separated from the house by a turnip field, provides a refuge, but it harbours a sinister secret. During the war, the miller was murdered by his wife and her lover.By his own attitude and actions, Simon becomes increasingly isolated. When he is driven to call on his father's spirit for support, it appears that the call is intercepted by the spirits at the mill, which manifest as scarecrows and imperceptibly advance across the turnip field to threaten the family. Simon's friend Tris la Chard comes to stay, and helps Simon to face up to reality and defeat the spirits. Read this to see what Molly was talking about. Teen horror. A very scary and realistic story by a great author...not for the faint-hearted! Fantastic fast paced book about facing your fears and an intriguing supernatural twist.Good book for teenagers..I felt like there could have been s bit more story around Simons 'devils' etc and it was also over quickly at the end. The story leaves you on such a high I was unable to go to sleep straight after and it was 3am! Another reread of a childhood tale. This one was part of a series called Puffin Plus, which I think were marketed as what would now be YA. I remember the original cover being quite a lurid painting of Simon in amongst the scarecrows, which was a little on the nose. The story itself manages to combine a child's eye view of family and step-parenthood with the notion of restless, historical ghosts. I read a few other Westall books, which I remember being pretty good, but this one always stuck with me. Not sure what made me pick up this book, I must have just liked the look of the cover. At times is was really creepy, but at other times it was a bit confusing. Overall though I did really enjoy it which is why it got 4 stars rather than just 3. If ever passing a group of old style scarecrows in fields I will definitely be creeped out but luckily I live in the city so we don't have fields that would have any scarecrows in them. [rating = A-]Fabulous. A very fast-pace and exciting book. Not to mention, surprisingly, well-written. A boy, Simon, comes to a Mill House with his new step-dad and tensions are higher than the deep blue sky. With the forces of evil closing in (a trio of scarecrows) and the arrival of an old friend things are on an all-high intense-level. Just a...WOW. Another re-read from my childhood. I used to love Robert Westall as a child, and reading his novels as an adult I have come to the conclusion that none of his appeal has been lost. I still find this book delightfully creepy but as an adult I absolutely hated the whining and selfish attitude of the protagonist, Simon. I probably loved him as a child though. I couldn't get into this book at all - I couldn't finish it. Good, but hella scary, from what I recall - I usually block out scary books. I picked this up in a charity shop, it had come from a Catholic school. I was surprised that the content would be thought suitable. Ghosts and strongly adolescents are a bad influence? Chilling, creepy, malicious, with a dash of family trouble on the side. I came away uncertain whether this was fantasy or psychological drama. I thought is was the latter but the ending confused me.